One of my favorite songs on my playlist is Great is Thy Faithfulness. It reminds me over and over that I can trust God to take care of us. Once again he has shown himself faithful in even the small things. In November, our old pickup truck just up and wouldn’t start. My husband tried to fix a few things like changing the battery but the weather was super cold and nothing seemed to work. We had no money to fix the truck with the extra expenses of Christmas and the new baby so the truck just sat in our yard. We really needed to be able to use that truck though. We don’t have trash pickup so we take the trash to the dump in the truck. We use it to haul water for the cows (our other option is to hand carry buckets of water from the house). The truck is our only 4-wheel drive vehicle as well. We decided to bite the bullet and take the truck in to the repair shop to at least find out what was wrong. A friend helped us tow it in so we wouldn’t have to pay for a tow truck. They found a broken piece in the keylock cylinder. Total cost to fix it was $97. In the meantime someone at church anonymously left us a card with a $100 bill in it! The Lord really does care about us even in the small things. I am so thankful for his care and this very physical reminder as we face a year that we aren’t sure how we are going to make it especially with the extra hospital bills to pay for. I know that he is faithful and will provide a way for us. Do you have visions of who you think you and your family are and then the reality of the life you actually live? The last couple of years this has really been a struggle for me especially as our kids have grown older and our lives have gotten busier and more complicated. 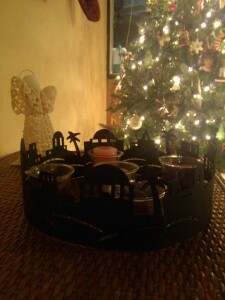 Advent has become even more important to me now as we purposefully slow down in some ways during this part of the year. 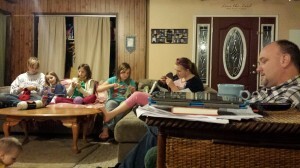 We sit around and sing and read and craft together. I welcome the snow and bad weather, enjoying the time we can just spend together as a family instead of running here and there. Especially this year, as we anticipate a new child during this Christmas season, the need for me to slow down and embrace family life is so strong! This is what I want and I know I can’t keep it in our schedule everyday but for this time I will embrace it and savor it and remind myself of what can be. No, it doesn’t happen every night but I will accept each time that it happens as a gift. This year we are going through Ann Voskamp’s beautifully illustrated new book: Unwrapping the Greatest Gift: A Family Celebration of Christmas and during my own quiet times I am reading The Greatest Gift: Unwrapping the Full Love Story of Christmas. I just love how she poetically turns the stories I’ve heard all of my life into deep and practical ways to live! My Christmas playlist has expanded to over 13 hours! I just love digital music! And with Amazon Prime I have been able to add lots of songs without having to spend more money! Although I have decided maybe I need to make a mini-Christmas playlist so I can hear my favorites more often. My favorite new album this year is Pentatonix’sThat’s Christmas To Me. I will always have a special place in my heart for a capella music and this album is just wonderful! 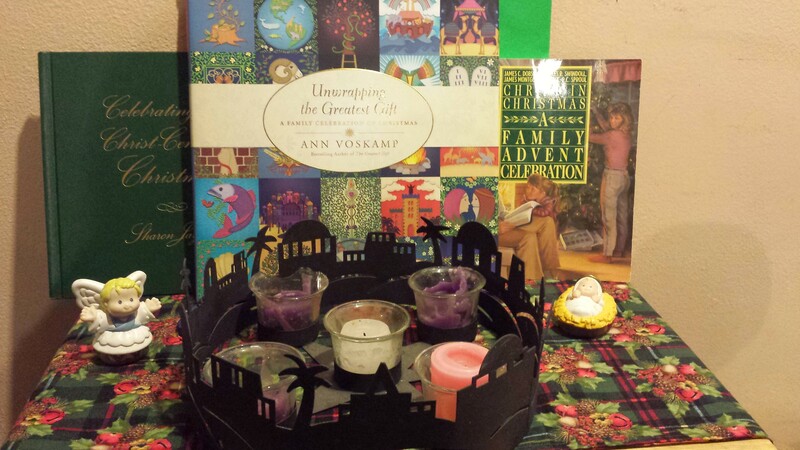 Here are links to ways our family has celebrated Advent over the years. I hope they will be a blessing to your family as well. May the Lord bless you and draw him to you during this Advent Season! Here is our list of verses for Advent this year. As the days grow shorter and the world draws us into a mad pursuit of purchasing the right gifts for every person we know while running from one event to another eating too much and worrying what everyone must think of us I long to settle my heart and focus on the light of Jesus and the different life he is calling me to. In our family a big part of that is accomplished by celebrating Advent. The word “advent” comes from the Latin word “adventus” which means coming or arrival. When we celebrate advent we are preparing our hearts and minds to celebrate not only Christ’s first arrival but to prepare ourselves in anticipation of his second coming. Advent begins on the fourth Sunday before Christmas. This year Advent starts on Sunday, December 1. 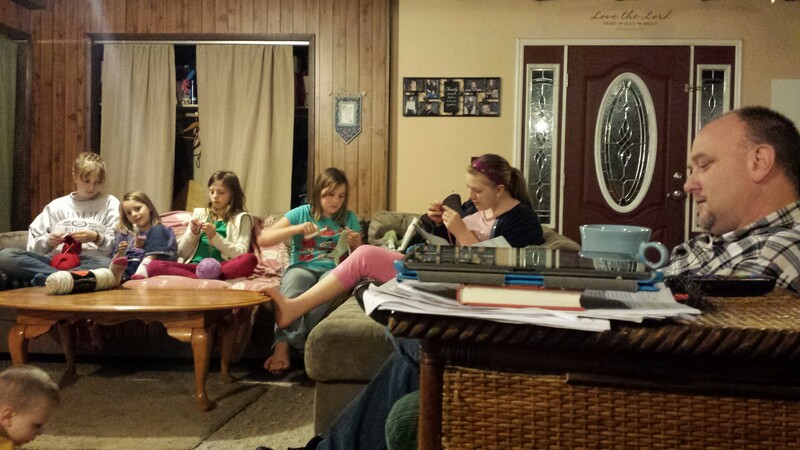 Advent Celebrations vary from family to family. Most commonly they include reading of selected passages from the Bible, the singing of Christmas carols, prayer and an Advent Wreath with 5 candles (3 purple, 1 rose and 1 white one or 4 white ones with 1 red one in the middle). Each candle represents an important part of Jesus’ story leading up to his birth. The scriptures focus on that theme for the week. The first purple candle is for prophecy. 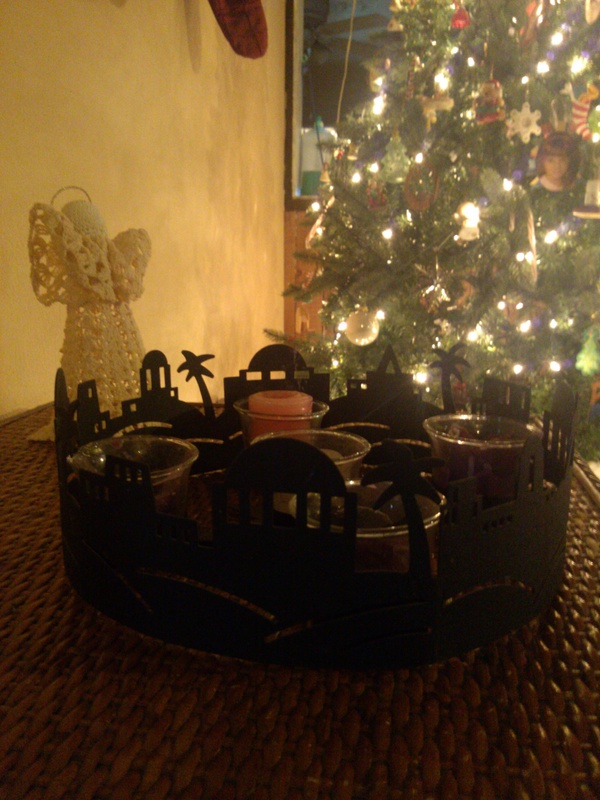 The second purple candle is for Bethlehem. The third candle is pink and represents the shepherds and God’s love. The fourth candle is purple and represents the angels. Then, finally, the white candle is lit on Christmas Eve and represents Christ. Another tradition that we have adopted is the Jesse Tree. I first heard of it on Ann Voskamp’s blog and now she has a lovely book about it called The Greatest Gift: Unwrapping the Full Love Story of Christmas . We use this children’s book, The Jesse Tree to follow the Bible story from Creation through Jesus’ birth and hang corresponding ornaments on our Christmas tree as we read each story. The idea comes from Isaiah 11:1 “There shall come forth a shoot from the stump of Jesse, and a branch from his roots shall bear fruit.” This passage is referring to Jesus coming from the line of Jesse. It is such a wonderful way to show God’s plan all along for the salvation of mankind. 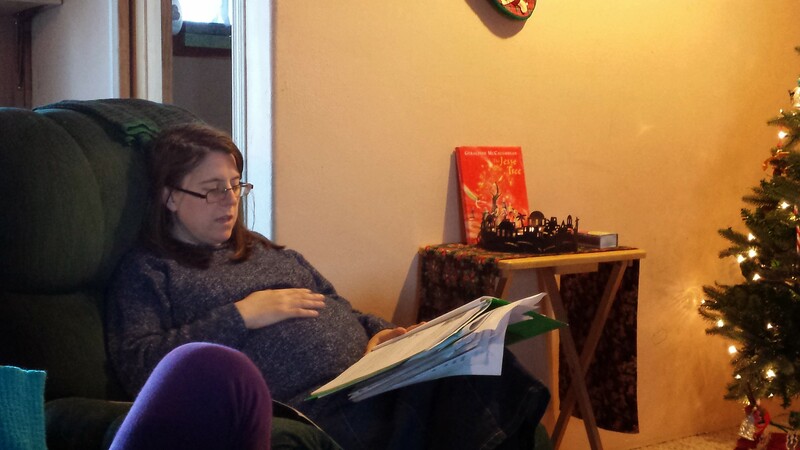 We try to “do Advent” every evening after dinner but life is busy this time of year so it doesn’t always happen. Usually on the weekend we will take extra time and catch up on our readings. Some years are better than others but each year we strive to do our best and it is now a firm part of our family tradition and believe God blesses our efforts to focus more on him and less on the materialism and craziness of the season. May God bless you and draw you into His light this holiday season. This year our garden was nearly a bust! We started a little earlier with a backyard garden planted the end of April. We enjoyed some peas and lettuce and had hopes of carrots, onions, beets and potatoes. Only the potatoes materialized. (So far we have had 3 meals from our own potatoes and there are still lots in the ground that I haven’t dug up yet.) Sunflowers also took over the garden. (I think from the chickens’ feed as they wintered in this spot.) At least they are pretty and we can use them for feed for the chickens this winter. In May we tilled a much bigger garden in the back pasture and had a wonderful time purchasing plants at the local nursery and planting seeds but our return was very sad. We tried to fence that garden to protect it from the cows but alas they found a weak spot and broke in. What they did not eat they trampled. All that remained were 2 patty pan squash plants, 1 green bean plant, 1 pumpkin plant, and 2 watermelon plants. Just before they closed for the summer I returned to the nursery and bought a few more tomato plants to try again. We planted them the next day. Not one but two storms raged across my garden uprooting all we had planted for the second time. But somehow a few tomato plants remained. By August I completely gave up on working in the garden. The weeds have taken over and everything has been sadly neglected. But I just couldn’t justify pouring my time into it for so little return. 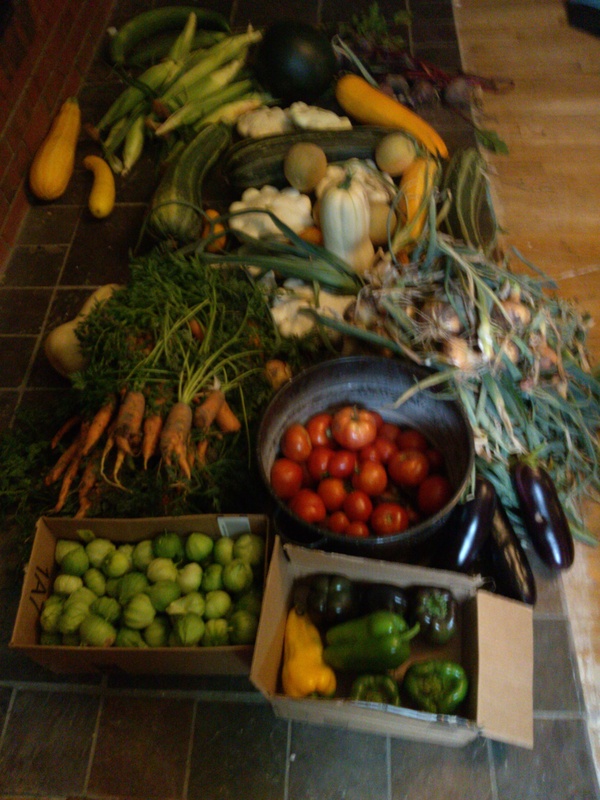 We were able to harvest a few pounds of cherry tomatoes, some patty pan squash, 1 watermelon, enough peas for a couple meals, and a few salads. The potatoes are looking promising although we’ve only dug a few of them up so far. Midway through August a cousin called me to ask if I’d like to buy some peaches they had trucked up from Colorado. Of course, I said, “Yes!” We went that evening to retrieve them and she gifted me with 28 pounds of cucumbers and 11 pounds of green beans from their garden. The next week she called again asking me to come get more cucumbers and beans. The following week another friend who had planted a one acre garden asked us to please come pick from their garden. She couldn’t deal with anymore produce and didn’t want it to go to waste. Then last week another friend called to ask us to please come pick peaches from her tree. (Who knew peach trees could produce fruit in Montana!) She just had too many and not enough time to deal with them all! The Lord has provided above and beyond what I could have ever imagined even (and maybe because) my own efforts failed to produce fruit.